When people say that so-and-so “can’t boil an egg,” they generally mean to say that the person in question can’t cook. Insofar as idioms go, it’s a pretty silly one; there are a lot of people out there who cook all the time, who cook all kinds of things that people like to eat, who can’t boil an egg at all. Because boiling an egg is both ridiculously easy, and easy to mess up at the same time. It’s really kind of tricky. I see badly boiled eggs all the time. Overcooked, horrible things with sulfurous dun-colored yolks, ringed with a nasty grayish-green penumbra. So gross. They taste awful too, chalky and rank. No wonder there are so many people out there who don’t like their eggs hard-boiled: they have only ever had bad ones. But a good, really good hard-boiled egg is delicious. It has a soft, silky white that cushions a rich and velvety yolk. A egg salad made with properly boiled eggs is creamy, full, and wonderfully fatty. It is very very satisfying. 1. Carefully prick the bottom of the egg (the widest end) with a needle, or a pin (I use a push pin). You want to pierce the shell, but not the membrane separating the air pocket in the base of the egg from the egg itself. Don’t worry: you won’t “ruin” the egg, it won’t “go everywhere,” it will not leak, it will not explode. It will be okay. 2. Place the eggs in a medium saucepan filled with cold water. The eggs should be covered with about an inch of water. The eggs might bob around, pricked end-up. Don’t worry. If it bothers you, you can just hold them down a little bit until the air in the bottom-end of the egg escapes, and they sink to the bottom of the pan. 3. Bring the water to a boil. When the water starts boiling, turn off the heat and put the lid on the saucepan. Set the timer for 10 minutes. 10 minutes. No more, no less. 4. Meanwhile, set up a nice ice bath. After ten minutes, lift the eggs out of the hot water and plunge them in the ice water. Leave them there for 5 minutes. 5 minutes. 5. Now your eggs are perfectly boiled, and ready to peel. Why is it important that you prick the bottom of the egg’s shell? Each egg has a small pocket of air at its base. Hot air expands, and by pricking the bottom of the egg, the small hole allows this air to escape. This will relieve any pressure caused by the expanding air, instead of cracking the egg while it is still cooking and making a mess. You can just boil the egg without doing this (see Technique #2), but why risk being sorry when you can be safe? 1. Place the eggs in a medium saucepan filled with cold water. The eggs should be covered with about an inch of water. 2. Bring the water to a boil. When the water starts boiling, turn off the heat and put the lid on the saucepan. Set the timer for 10 minutes. 10 minutes. No more, no less. 3. Meanwhile, set up a nice ice bath. After ten minutes, lift the eggs out of the hot water with tongs. Right before submerging them in the ice water, bang the widest end of each egg against the countertop. You want to crack the shell at the base. Leave the eggs in the ice water for 5 minutes. 5 minutes. 4. Now your eggs are perfectly boiled and ready to peel. 1. Carefully prick the bottom of the egg (the widest end) with a needle, or a pin. You want to pierce the shell, but not the membrane separating the the air pocket in the base of the egg from the egg itself. 2. Place the eggs in a medium saucepan filled with cold water. The eggs should be covered with about an inch of water. 4. Meanwhile, set up a nice ice bath. After ten minutes, pour off the hot water. With the lid on the pan, shake the eggs enough so that their shells crackle. Submerge them in the ice water. Leave the eggs in the ice water for 5 minutes. 5 minutes. Why is cracking the shell after cooking important? You want to crack the shell so that any sulfurous smells inside of the egg can escape and dissipate into the ice water bath. Or so says Jacques Pépin. Oh no, my eggs are hard to peel! What happened? Your eggs are hard to peel, my friend, because you have very fresh eggs. The fresher the egg, the harder it is to peel it. The older the egg, the easier it is to peel. So it’s okay if some of the egg white comes away while you are peeling the egg. Sometimes, peeling them under running water helps. This all might seem like a fussy way to boil eggs, but believe me, once you do it right, you’ll never want to do it badly again. Now back to the recipe . . .
1. 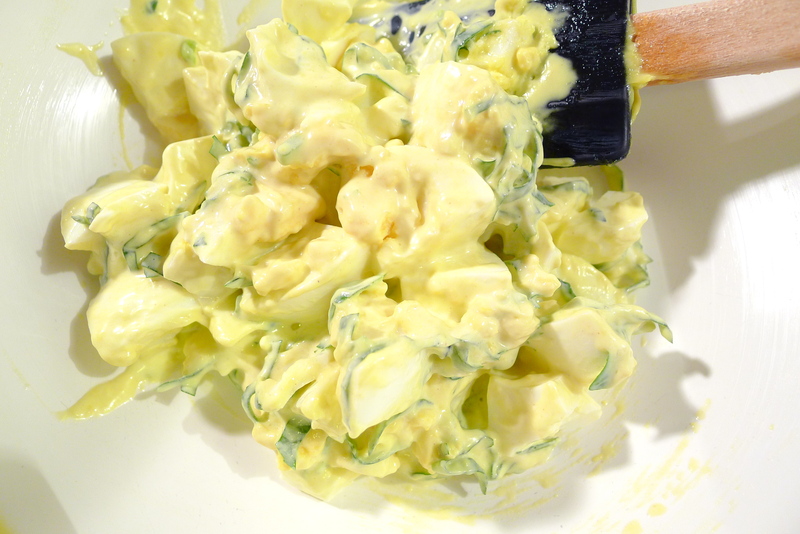 In a large bowl, combine the eggs, the mayonnaise, the basil, and a good sprinkling of salt. Add the lemon juice, a little bit at a time, until the salad is nice and creamy. Adjust the seasoning if needed. 2. Heap a large spoonful or two on top of each piece of toast. Serve immediately. 1. Whisk the lemon juice, salt, and Dijon mustard together in a medium-sized bowl. 2. Measure out the olive oil into a cup with a pouring spout. 3. Whisk the egg yolk into the mustard mixture until it is well-incorporated and creamy. Continue whisking while you add a few drops of oil to the mixture. Whisk until completely incorporated before adding a few more drops. Try not to add too much oil, too quickly in the beginning, or the mixture will not emulsify. As the mixture begins to thicken, begin to add the rest of the oil in a thin and steady stream while whisking constantly. If using a hand-blender, hand-mixer, or food processor, just start slowly adding the oil in the beginning, before adding the rest in a steady stream. To help you visualize how mayonnaise comes together, here is a really good video clip. This recipe sounds fantastic ! !I can’t wait to try it ! I never knew about the pricking of the shell before I’ll definantly try that.! I do however have a wonderful tip for removing the egg from the shell ! Once cold. crack each end , then roll the egg between your palms , (anywhere between 6 to 10 times approx) this separates the egg from the shell and the egg should pretty much just slip out of the shell !! Takes all the work out of it !!! Post back if you try this method !!! Ooh! That is a great tip for peeling eggs! I always have a little trouble with that. Especially if the eggs are really fresh. I will try your method. It sounds like the key! awesome read! Eggs being my favorite thing to eat and cook with, your post certainly shows your passion and respect for this amazing ingredient! thank you for caring!!! Thanks, Paul! Eggs are my favorite too. When I did that cooking internship in France, I spent so much time making omelettes. Crack three eggs, beat them, cook them, and then have someone throw them away because they weren’t perfect. Repeat. You have all new respect for eggs after that! wow, I didn’t know you did an internship in france, that’s badass! 🙂 so jealous now! I wonder how I’d feel if somebody came and threw my eggs on the floor… yikes! Floor? Non, non, chéri. Poubelle. They all went in the poubelle! hahah, i had to look that up! Yup. Nothing like sweating the perfect torpedo-shaped omelette and having someone tip it into the trash over and over again. Very French. I don’t eat many omelettes any more!